Sony Ericsson is prepping its biggest UK marketing campaign for XPERIA Play launch at 31 March. Meanwhile LG is working hard to unleash the Optimus 3D in “late May”, again in the UK. It seems the Sony Ericsson’s "late March release" promise about the XPERIA Play actually meant the end of March. The XPERIA Play will be released on 31 March in the UK going with the biggest marketing campaign Sony Ericsson has done on the Island so far. 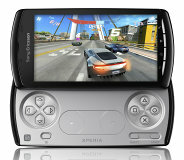 The XPERIA Play will be available on all major UK carriers, in various game stores and online retailers. It will come with six pre-installed games, but if we are to believe Sony Ericsson, there will be at least 50 more titles waiting for you in its dedicated game store. There is still no official word on the retail price, but Amazon.de has it on pre-order for 540 euro. We haven't heard any update about the US launch, which was scheduled for March with Verizon being the carrier of choice. In other news, an LG spokesman has kind of confirmed the UK Optimus 3D launch for late May. His exact words actually were: “At this stage, it’s looking like a late May launch.”, so it’s more like a desired time frame, not the official one. At least you know what LG hopes for a release date before the summer.